Last year's 50th Anniversary figures were all pretty easy to find (with Social Clash actually hanging around long enough to reach clearance, which doesn't do much to dissuade the idea that girls don't sell), but so far this Marine Devastation pair is the hardest to find - my TЯU was on their third stocking of the figures before I was finally able to get one. Part of that is because it's only one per case, and part of it is because this is the only set in this series to have a new figure. Born into a Cajun clan in the Louisiana swamps, Gung-Ho joined the Marines and graduated top of his class from Parris Island. He's meaner than a Louisiana black bear in battle and faces imminent disater with a big grin; in other words, he's a Marine. While conducting night recon on a Cobra base, he is attacked by Cobra Shadow Guard troopers, and teaches them not to irritate a bare-knuckle brawler from the bayou. Okay, so maybe "new" figure was stretching things a little bit - Gung-Ho was in the first 25th Anniversary Collection box set, then solo-carded, then repainted for a comic pack (to say nothing of the movie/Resolute version) - but this isn't the same old mold. This giant beast of a figure (4⅜" tall in a 4" scale equals 6'6") was first seen in the concept case at JoeCon 2013, so it's nice that they've finally gotten around to releasing him. The figure was sculpted by Fred Aczon, who's now one of the Boss Fight Studio...ers. There are no parts shared with any other figures. Yet. Last time the bare chest got used a lot. The face has a weird look that I can't quite place - like he was based on someone famous - he does have his mustache, though the original didn't wear it handlebar style. As with the last Gung-Ho, his vest is a separate piece over a bare torso. The blue chosen for his clothes is weirdly bright; like, Miami Vice bright. Hasbro insists that these colors are an exact match for the 1983 original, but they really should have stuck with the colors from the last figure. Also, the grey of his boots doesn't come up high enough, making the legs look sloppy. One thing that is better, though? His chest tattoo. It's bold and huge, just the way it should be. Remember the small, faded one from last time? Well forget it, because this is the way it's supposed to look. It's a little off-center, and goes all the way up onto his neck, but we'd rather it was wrong this way than the other way. In addition to the new vest, Gung-Ho's accessories include a knife and a pistol that fit into the holsters on his right thigh and left boot, respectively. He's got the giant backpack and chain gun that came with movie Heavy Duty, and a standard bandolier of bullets. Considering that this gun only came out six years ago, the detail is ridiculously soft. 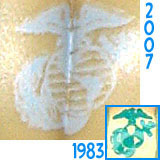 Oh, and the bullets are the same blue as Gung-Ho's clothes. 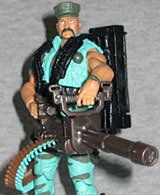 He also comes with an M249 Paratrooper SAW with a removable ammo clip, and a one-piece grenade launcher. Why no hinge? Cobra Shadow Guard troops specialize in nighttime operations. They blend into the shadows on missions of sabotage. They've developed their own hand signal system that even other divisions of Cobra troopers are not privy to. Also, they enjoy every opportunity to enhance their air of mystery. When they spot Gung-Ho doing night recon on a Cobra base, they silently surround him and prepare to attack the GI Joe team member. Hmm, interesting. That filecard makes the Shadow Guard sound like Cobra's equivalent of GI Joe's Night Force. But this figure is an update of a Generation 2 release, the Crimson Shadow Guard, a Toys Я Us-exclusive six-pack from the Valor vs. Venom line. So it's still kind of "new," in that there hasn't been a G3 version of that specific idea. But even better, if you remember The Plague, the 13-member Cobra special ops team that was drawn from various ranks and wore all-black, this figure could very well be Infrared! Okay, The Plague all wore matching sweaters, like a family taking their Christmas card photo, while this figure is a straight repaint of the Retaliation Crimson Guard. That was a nice enough figure, and if you got it, this will give you a chance to use more of the stickers. The black is broken up by silvers and greys, and a gold Cobra logo. 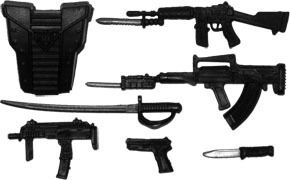 Most of his accessories come from that same figure: a vest, a backpack, a pistol, a sword, a knife, an MP7A1, an OTs-14-1A-02 Groza, and then the same bayonet rifle as the original G3 Crimson Guard from 2008. All the gear is dark black, matching its owner. I like the Plague enough that I'd buy Generation 3 versions of all of them, even if they were all wearing the same plain sweaters, but the idea that this figure could represent Infrared didn't even occur to me before I bought the set: it was Gung-Ho alone who sold this pairing. It's understandable that this would be one of the shortpacks in the series - each case has two Storm Shadows, two Cobra Commanders, two of the armybuilder set, and then one each of this and the god-awful Blowtorch/Croc Master combo - but that still makes this one hard to find. 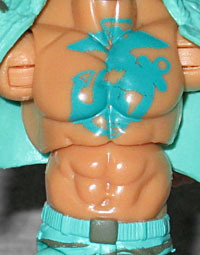 CC may be famous, but the toy looks crummy; they should have shipped one of those and two of this. The entire series seems to be selling well, though, so that's a positive sign of health for the brand.